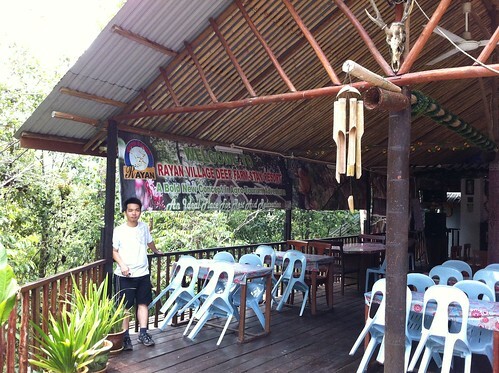 The Rayan Village Deer Farm, is hidden at the Singai village, Matang, Kuching. Singai village is named after Mount Singai, the mountain of myths and legends of Togung Kidau, the Flying Warrior, Warrior Princess Mikawel, Togung Kopear, who according to legend could throw objects for miles, and many others. The farm covers an area of approximately 20 acres and is located at about 40 minutes (drive) distance from Kuching city. To reach the farm, drive along the Batu Kawa/Bau road, a SIGNBOARD points to a right turn at the junction opposite Tondong bazaar, then drive in for 3km where the signboards will guide you to the farm. The farm is the first deer farm home stay in Kuching, as the owner build a longhouse style chalet for people to spend a night there. Check out my video below on how is the chalet looks like.